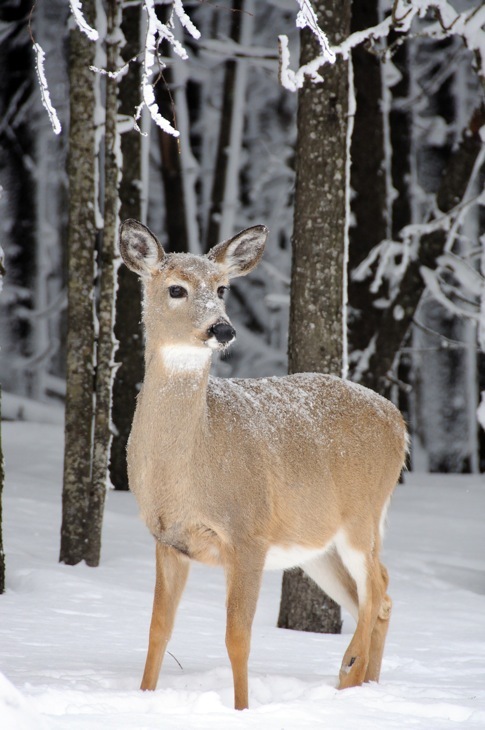 Pocahontas County, a rough and rural region on the central West Virginian border with Virginia, is highly populated with small whitetail deer. This one was feeding in the front yard of a home when I spooked it. The animal is climbing through a barbed fence. 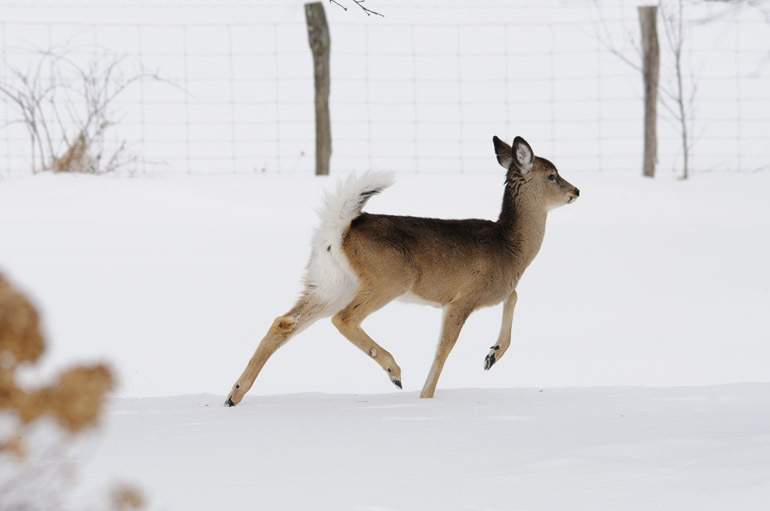 The deer dashed away into a snowy field. 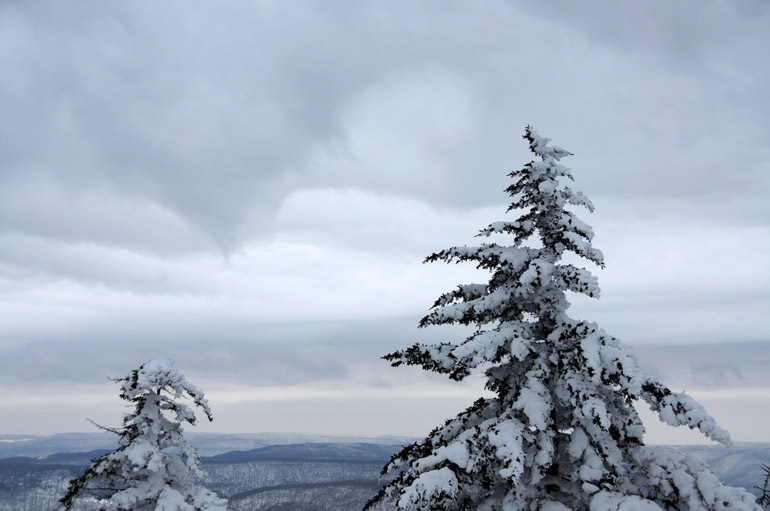 The top of Snowshoe Mountain, home of one of West Virginia's popular ski resorts, provided the snowiest vistas of my trip. 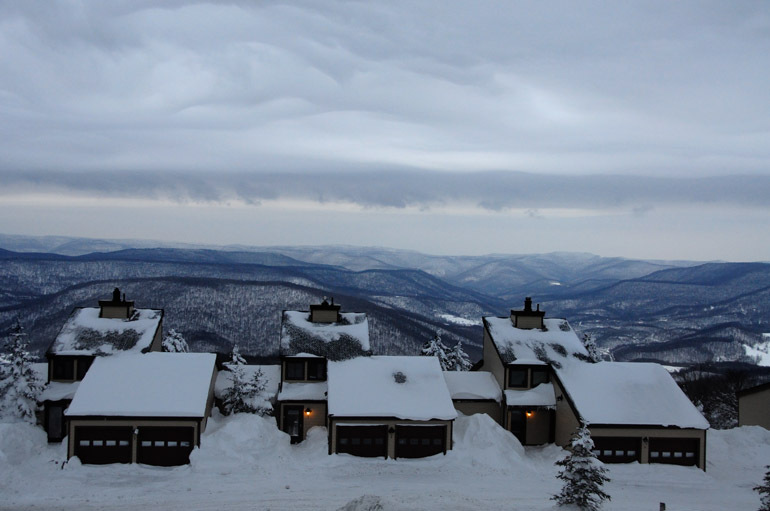 In addition, the cloud layering provided an interesting background for the landscapes at 4,850 feet. 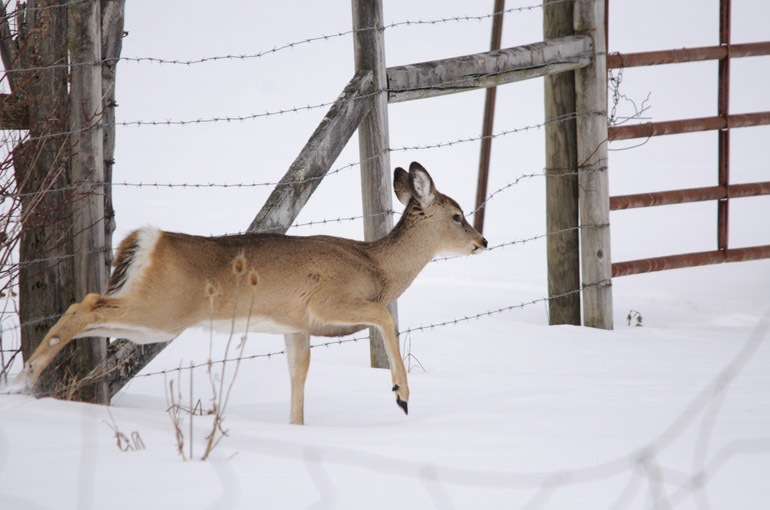 Even high on the mountaintop, deer roamed freely. 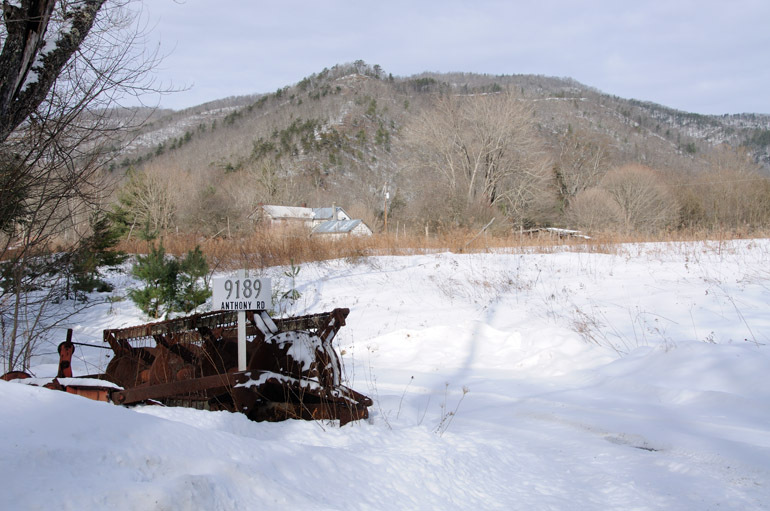 In daylight on Monday, the third day of my weekend snow search, West Virginia and its small towns reminded me of home in Maine. Rifles hung from the window racks of pickups. 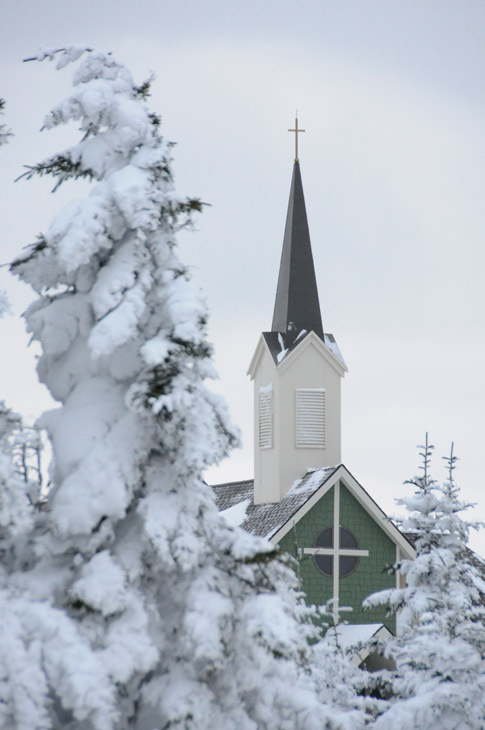 All towns, no matter how small, had more than one church. Gas stations allowed people to pump fuel before paying. Boys walked down the street, many smoking a cigarette and dressed in dirty jeans and a baseball cap. The mailman drove a regular vehicle with a Postal Service sign on top. After fueling up on coffee and briefly exploring Lewisburg, in beautiful Greenbrier County, I drove north on State Route 92 through Seneca State Forest and Monongahela National Forest. There were several points along the way when I saw a scene I wanted to photograph - perhaps a house in a field, a snowy fence or a hillside littered with deer. But for the most part, there were simply no places to park along the road. So, much of the trip was about me enjoying the moments rather than capturing them with a camera. 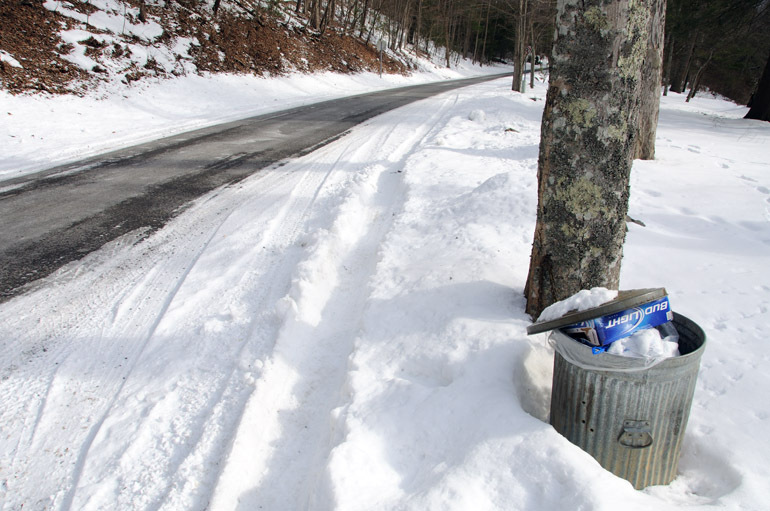 A series of turns later and I was on a steepening road in Pocahontas County, leading to Snowshoe Mountain Ski Resort. 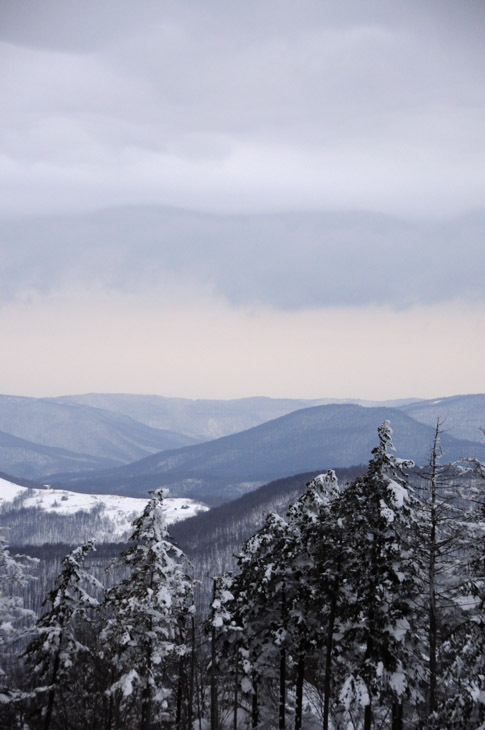 A co-worker, who's a native West Virginian, said there was a high probability of deep snow on the mountain, which rises about 4,850 feet above sea level. 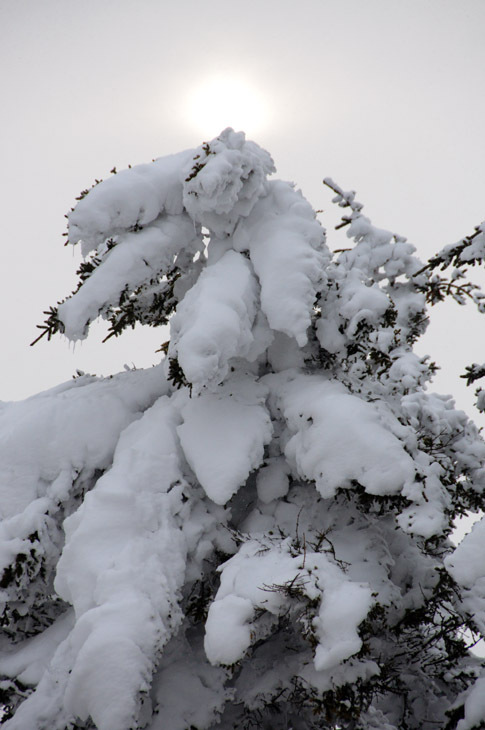 When I reached the top, the evergreens were coated in white stuff, but the sky was darkening, and flurries began to fly. 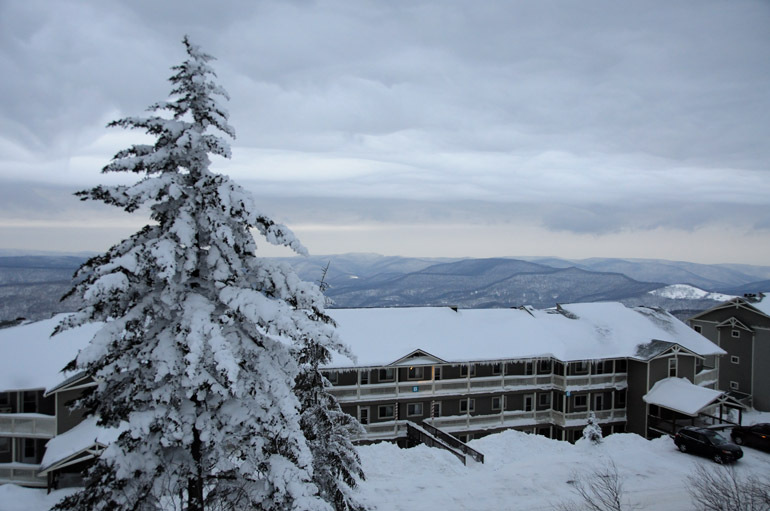 I knew more was on the way, and if I wanted to get back to civilization alive, I couldn't stay long at Snowshoe. After taking photos of the approaching storm system and of other scenes throughout the resort, I embarked on one of the most hair-raising experiences of my 26 years on this planet. For 87 miles, I traveled over corkscrew roadways that led up and over mountain after mountain. The worst part: I couldn't see but 15 feet in front of my car. The snow was coming down at a horrendous clip, and the sun had called it quits for the day. The road was so covered that I couldn't see the yellow lines. I didn't meet a single snowplow that could have made a path for my light, two-wheel-drive sedan. There weren't many homes that could have provided a refuge. And there wasn't any hope of getting a cell phone signal. There was a point on those country roads of Pocahontas County when I wanted to punch John Denver, if he were still alive. Those country roads weren't taking me to a place I belonged. There were a few bright sides, though. I had nearly a full tank of gas, so I could have pulled over and waited out the storm in my warm vehicle. And the roadside snowbanks were so high that they would have prevented me from plummeting over a cliff if I were to lose control. At a average 20-mph clip, it took hours to make it out of the wilderness near Sutton, in the central part of the state, where I entered Interstate 79 southbound toward Charleston. It was a death-defying experience, one that produced zero photographs and a lasting memory to cherish until the next time I get stuck in a snowstorm. 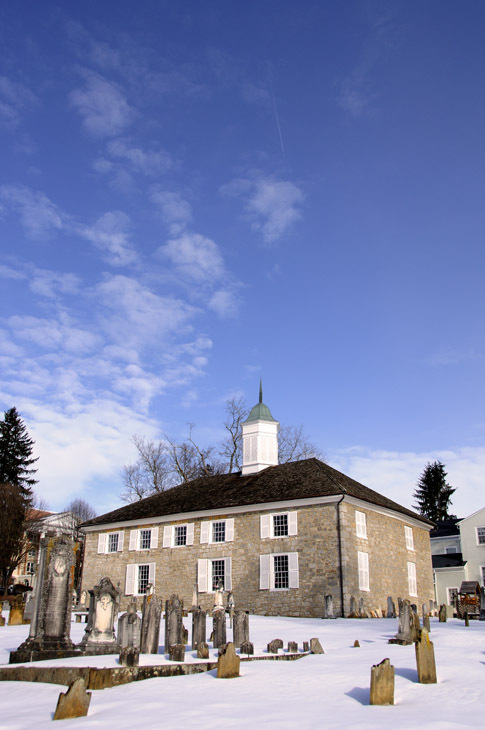 A 214-year-old Presbyterian church in the small city of Lewisburg served as a makeshift hospital during battles of the Civil War. 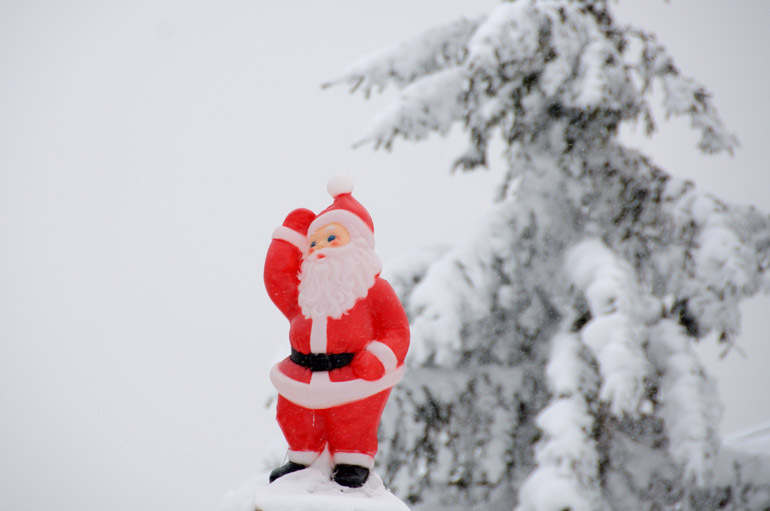 I noticed elements of the Christmas season still hanging on. 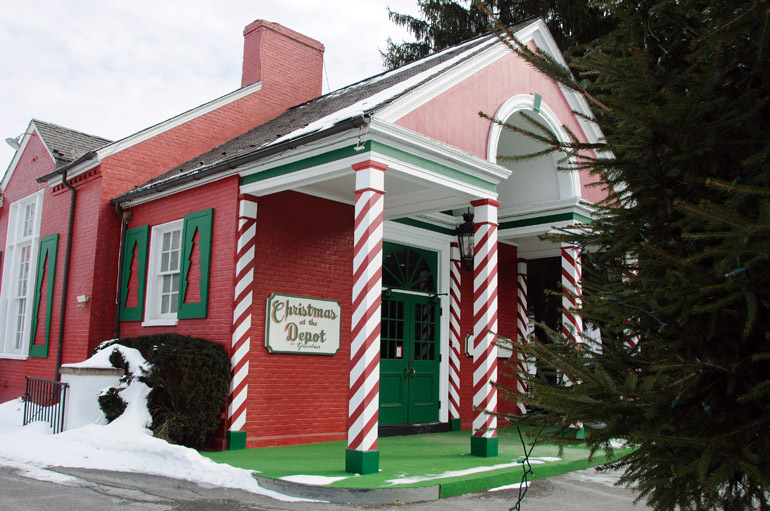 This train station sits near The Greenbrier, a casino-golf-spa resort in White Sulphur Springs. 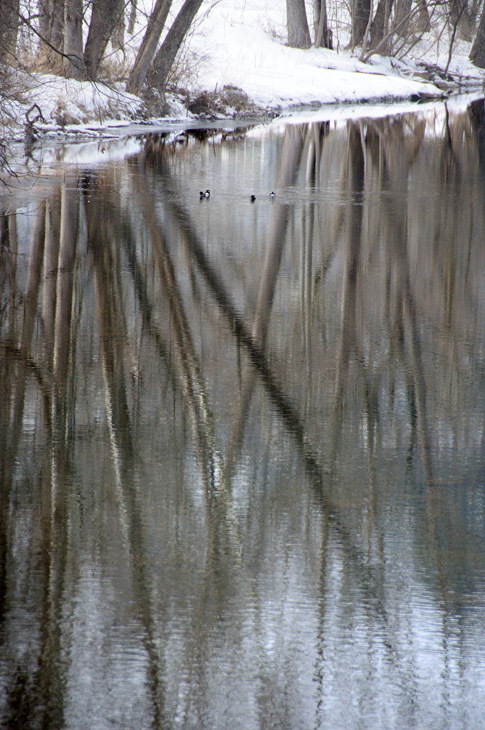 Trees reflect on the surface of Howard's Creek in White Sulphur Springs. 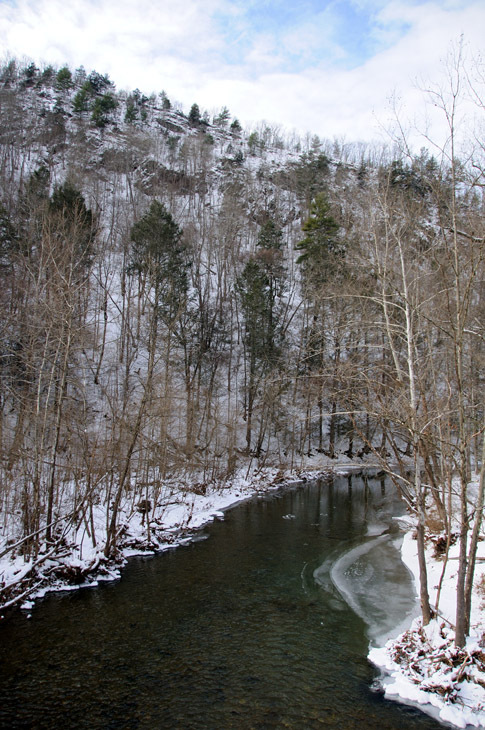 In Monongahela National Forest, I took a brief detour onto Anthony Road, which afforded many similar views of Anthony Creek. Apparently, I just missed the party. But I was expecting empty bottles of moonshine, not Bud Light cartons. 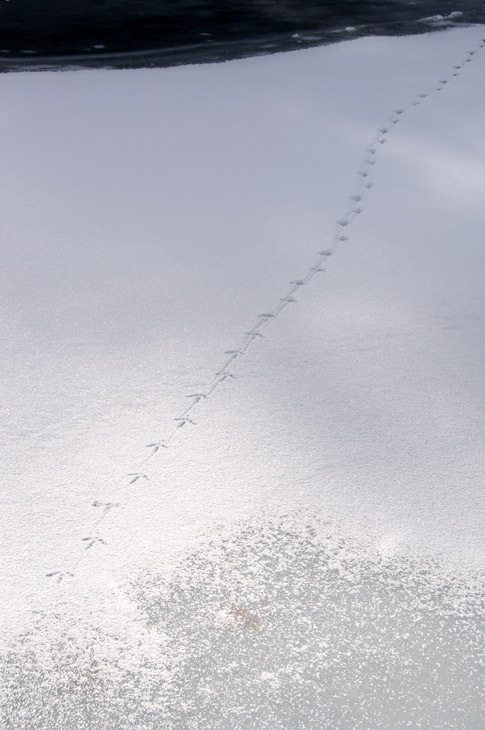 Bird tracks lead across thin ice over Anthony Creek. People who live here must enjoy their lives of seclusion. 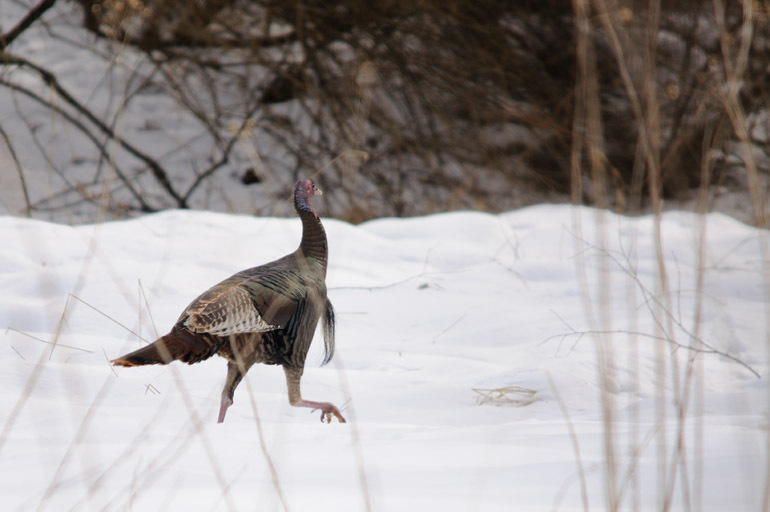 I spotted a pair of turkeys along State Route 92 through Monongahela, and I shot one of them. Because of the snow, this was one of the few spots where there was room to pull over and take photos. 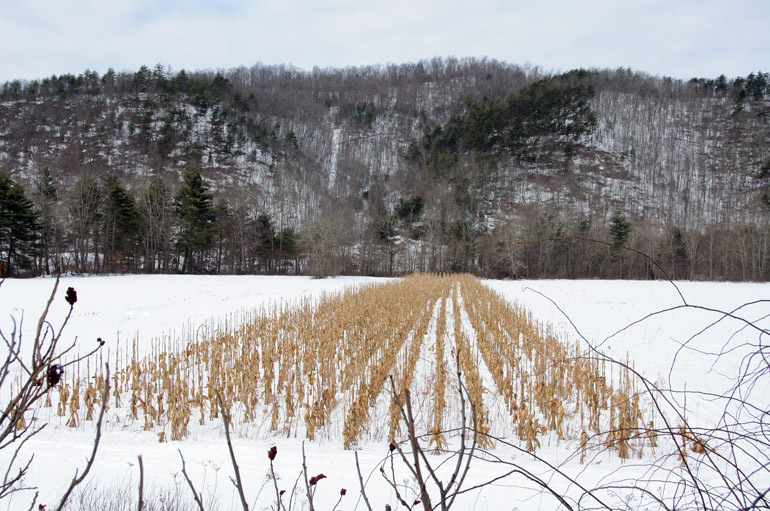 Many of these scenes, including this cornfield, weren't particularly picturesque. It might have been better after a fresh snow. 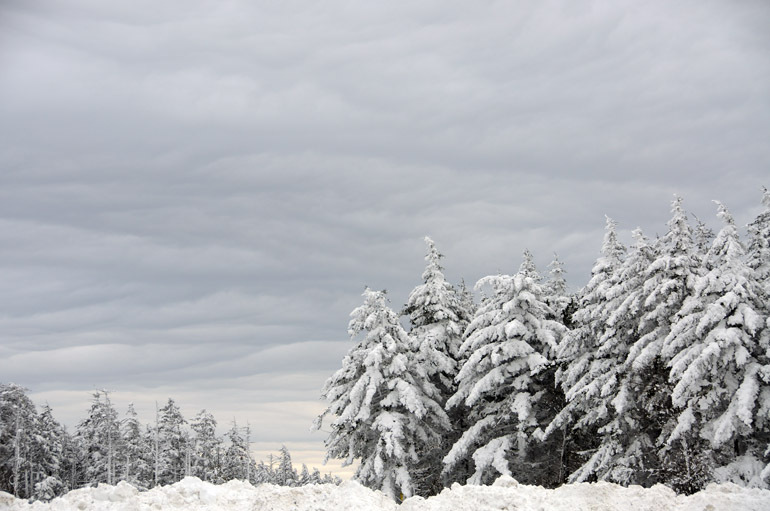 Despite that, I risked getting stuck for this photo by pulling onto the snowy roadside. Then, I cut myself somehow on a prickly barb in the stand of sumac in the foreground. Poor me. 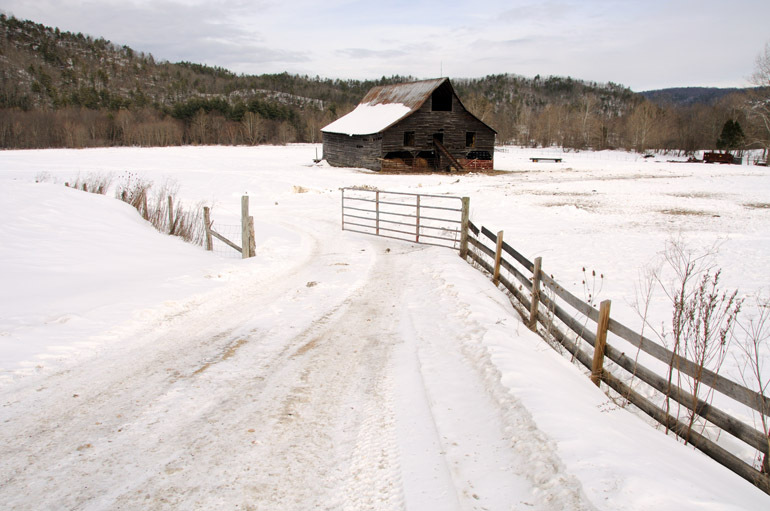 These scenes were prevalent through Pocahontas County. I was able to shoot this one only because it was next to a gas station with a somewhat plowed parking lot. 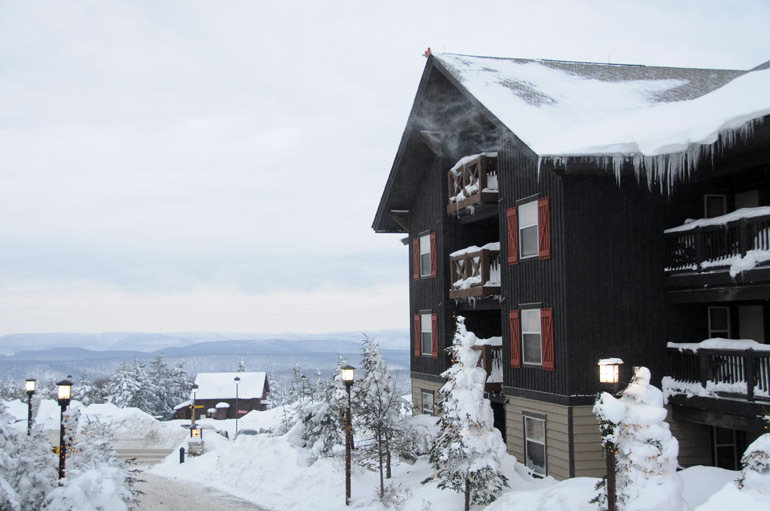 Snowshoe Mountain is full of many lodging communities for visitors. I wasn't about to pay to spend the night, though, despite an oncoming snowstorm that could have stranded me in the mountains. 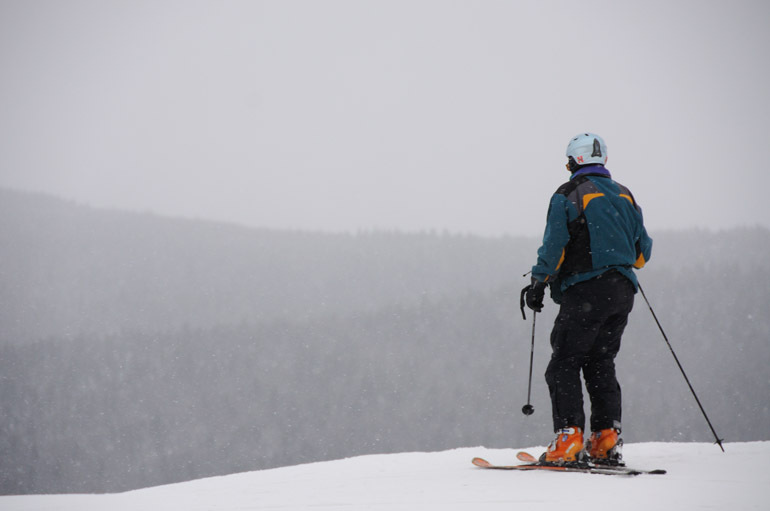 A skier surveys one of Snowshoe's slopes as snow begins to fall. Unfortunately, I wasn't dressed to go trekking over the slopes. 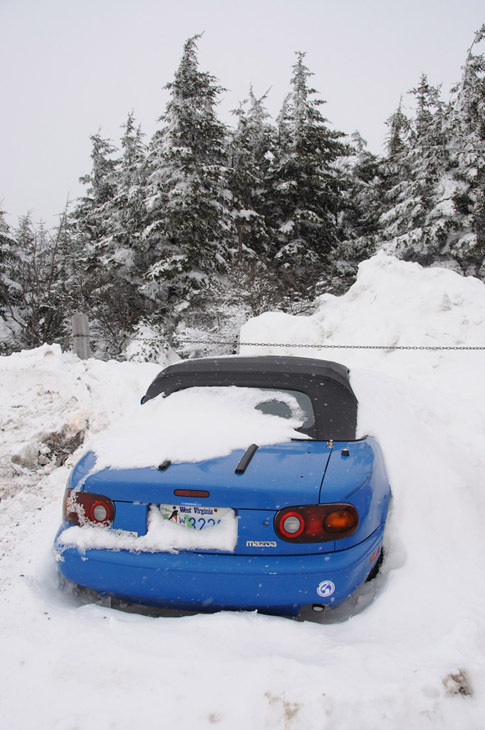 A convertible is appropriately stored and insulated for the winter. The sun peeks through the overcast sky. 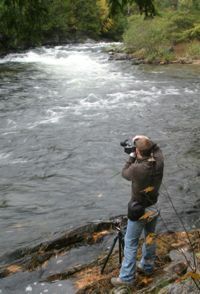 At this point, I was becoming highly irritated by the conditions. My hands were withering and being sucked dry by the cold, and even my camera was slowing down in the single-digit wind chills. 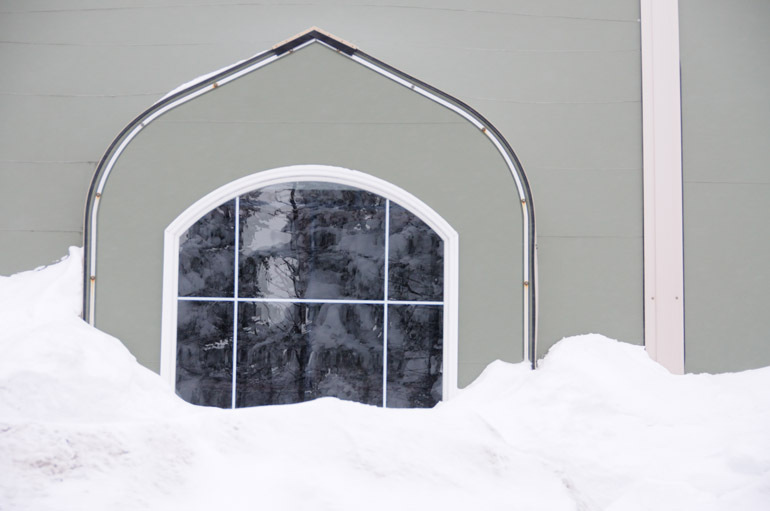 Snowbanks on the sides of buildings partially covered some windows, including this one on a medical clinic. Snow blows off an icicle-lined roof. 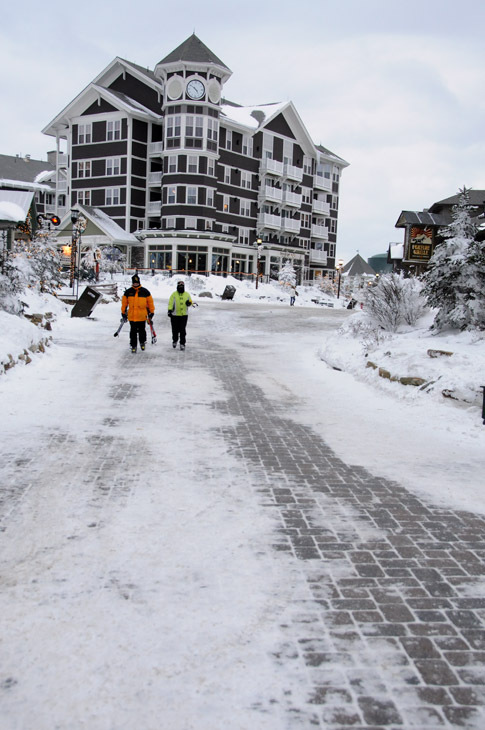 The main walkway through the resort's shopping district. The last vestiges of sunlight filled the horizon. 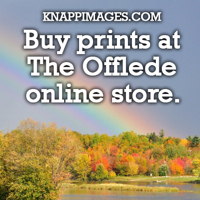 I'm sure scenes like this would be beautiful in the fall, so I might have to return. 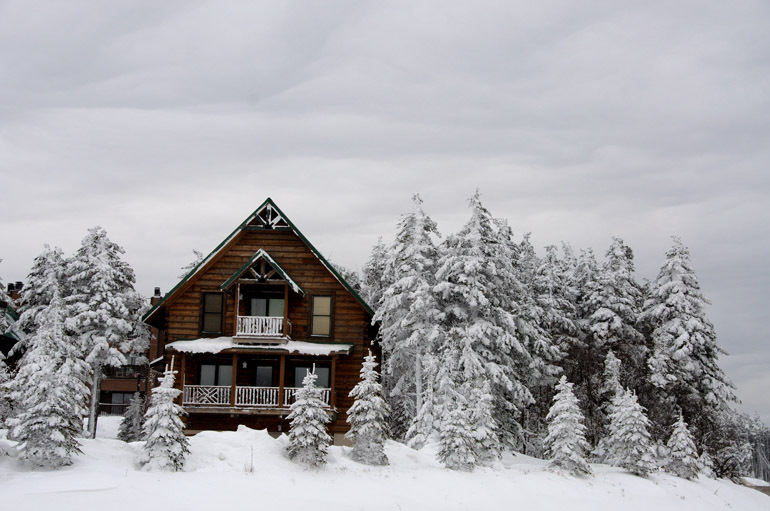 A layer of clouds approaches over a mountain lodge, a sure sign of the oncoming storm. 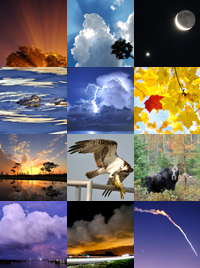 The sun faded, and the clouds darkened. The trip down the mountain and toward the nearest highway, 87 miles away, was when the real fun began after I snapped this final shot at Snowshoe.